Wardrobe Architect - Week 8! You may have noticed this week's post was a little delayed. Week 8 was examining my hair and beauty routine. When I originally sat down to write the post, I knew my routine was a little sporadic, but I didn't quite realize how erratic it is. I like to wear make-up, but a lot of mornings I feel too rushed, or not quite awake enough to get it on. However, I think it should be a fairly simple adjustment to start putting on 5 mins of makeup after I wash my face in the morning. My 5 minute make up routine is just a quick brush of eye shadow, eyeliner and mascara, and of course a nice red lip on my way out the door. My hair routine has fallen into a rather dull rut. I cut it shorter over Christmas. I haven't quite figured out what I can do with it now. I tend to pin it up in a twist. It looks nice and put together, but at the same time, a little dull when done over and over again. I can leave it down, but my hair is very thin and tends to be fairly flat. I've been trying to get a successful pin curl set, but it's still a work in progress. So, today I've not so much found my beauty routine as found the holes in it. But, admitting I have a problem is the first step to a solution. Here's hoping! This week's exercise from the Wardrobe Architect was to pick colours, and week 6 was to organize them into Neutrals, Nearly Neutrals and Statement Colours. But, for the most inexplicable reasons, it was insanely difficult to pick colours for my wardrobe. I'd already decided I wanted red and navy to be the main colours in my wardrobe, so I expected officially picking to be a quick and easy task. Boy, was I wrong! I'm not sure if it was confining already having some chosen, or if was because I didn't know what to add, or if it's because it was too open a concept -- whatever it was, this was a hard week of wardrobe rebuilding for me. For Neutrals, I have Black, White, Brown and Grey. 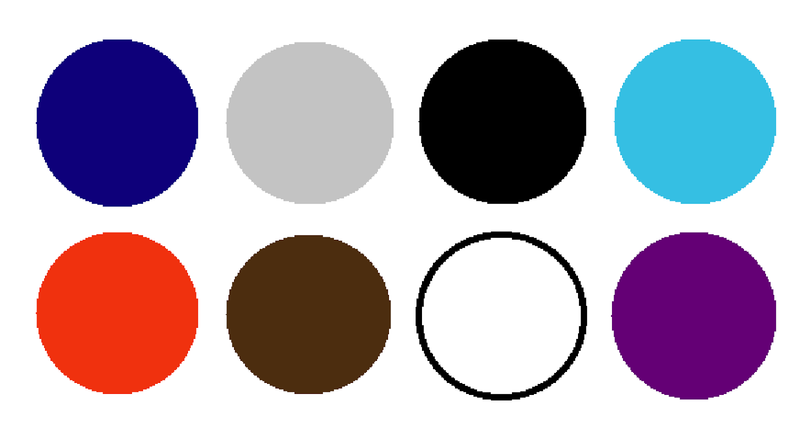 My Nearly Neutral is Navy Blue and my Statement Colours are Red, Light Blue and Purple. Now, I only have one Nearly Neutral, however, since I have four Neutrals, I feel like I can get away with it. And, since I'll be planning out all of my pieces in Week 11 (not that I read ahead, ahem), I can always come back and add in some more colours, if I need to. I'm sure i'll be easy, given how this week went! 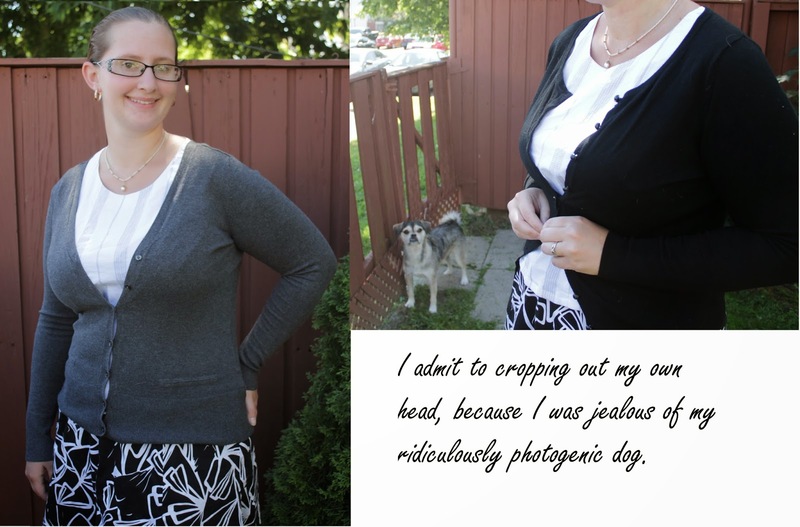 This is Week Four of the Wardrobe Architect Series from the Colletterie. 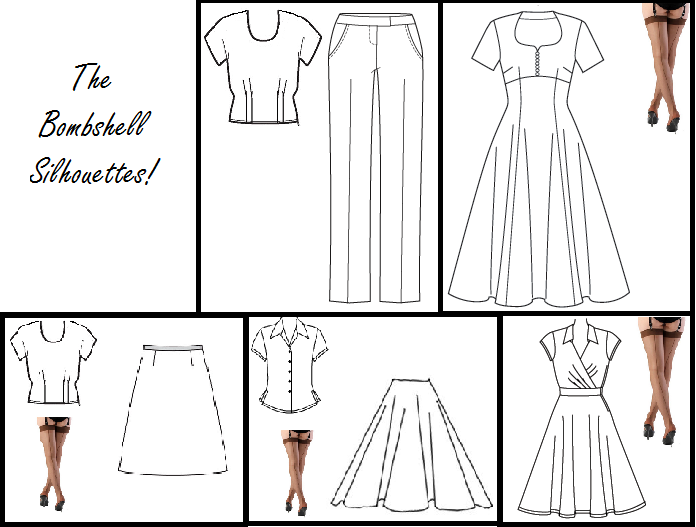 This week's task was to design your Silhouettes, or wardrobe templates. I've designed five templates for my outfits. I've picked two types of dresses, a simple full skirted dress with a fitted bodice, and a warp/faux-wrap dress. I also chose pants and a top, a circle skirt and a top, or an A-line skirt and a top. The stockings above are all from What Katie Did, I haven't tried them personally, but I've heard wonderful things about them from around the blogosphere, and they're definitely on my wish list! I've got a few patterns in mind for the dresses, particularly the ones on the Pinterest Board. I've got quite a few top patterns to use as well. There are the the two that I've made already, the Portrait Blouse and B6085, as well as the vintage S1590. I'm sure I'll come across some others as I go, but that's what I've come up with so far. For pants, I've been relatively happy with my latest rendition of B5682, but I would also like to try out my two Wearing History Patterns. Circle skirts obviously will not need a pattern. I'd love to do a tutorial, if anyone would be interested, in drafting and constructing a circle skirt. There's one A-Line skirt I'd like to make up, from Sew News August / September of last year. It has a cute sailor-style button front. I haven't picked any other ones specifically, but A-line skirts are easy to draft as well, or to come across patterns for if I really need one. And there we are, Silhouettes outlined! Let me know in the comments if you'd be interested in a Circle Skirt Tutorial or Sew Along -- I'd love to arrange something. Firstly, I have a confession. It would appear that in my eagerness to get started with my wardrobe overhaul attempt number I've-lost-count, I've gotten ahead of the 2015 running of the Wardrobe Architect. So, I'll be following the older version from last year, which you can find in a nice collection at the Colletterie. Anyway... in week three we start to look at shapes that you like and feel comfortable in. 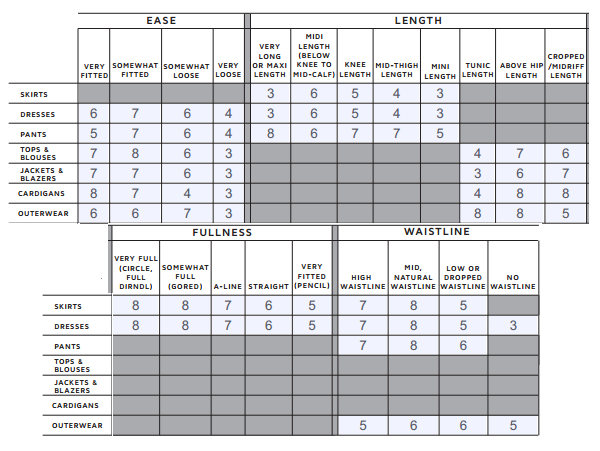 In the homework there is a pair of handy charts to fill out, ranking how you feel in a huge variety of garments. I've been doing some pretty deep navel gazing for the past little while about my wardrobe, so none of this really came as a surprise to me. I like dresses that are fitted in the bodice, and looser in the skirt for everyday where, with a waistline that sits right around my natural waist. I like my skirts to be a little fuller, and my tops to be fitted. I prefer necklines that elongate my chest. Jewel or high necklines leave me with a large (and broadening) expanse of fabric over the bust. I don't like long sleeves (because they get in the way and I just push them up anyway), but three-quarter length is something that is under represented in my wardrobe. 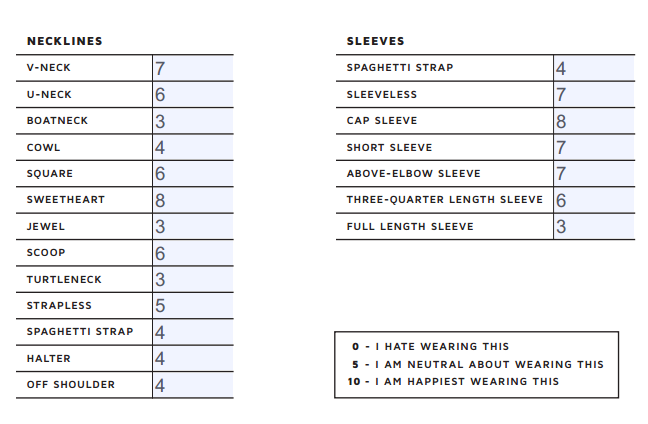 Generally I prefer some variation of short sleeves. Apparently it's possible to have posture that is just too good -- or maybe I'm just jealous. Today's fitting problem is that of the Too Erect figure. This causes the waistline to be too long at center back, and create fabric pools or wrinkles between the shoulder blades. It is a quick fix as well, with just a single dart across the shoulders. Start by making a cut across the back where the fabric pools are the greatest, leaving a hinge in the pattern at the arm scythe. Then overlap the two sides, creating a dart that tapers to nothing at the arm scythe. This will shorten the waist at center back, without adjusting the fit at the sides. And there we have it, all of the fitting problems for the back bodice are fixed. Next week we'll move on to second form of Full Bust Adjustment. If you need a refresher on the first type we did, you can find it here. As always, if you have any questions leave them in the comments below. And if you have any types of fitting adjustment for the back bodice you'd like me to cover, leave that in the comments as well! There are so many holes in my wardrobe still that it can be hard to pin point exactly what they are. When asked what the problem with my wardrobe is, I tend to just wave at the closet and reply "all of it". However, one thing I've really noticed I'm missing, as the fall weather starts to roll in, are layering pieces. While I've almost perfected my Portrait Blouse (version 4 should be perfect), which is a perfect under layer, I don't have a lot of cardigans to go over them. And so, off to the local thrift shop I went. I'd been a few months ago, in the heat of summer, just to check it out, and there had been a huge variety of cardigans. When I went this time, there was less of a selection. It really is all about timing. Even still, I found two cardigans I like. I chose the grey and the black because they were both neutral and fit with the colour scheme I already have in my wardrobe, as well as the one I'm building towards. I also found a pair of knee high boots for a steel. They look fabulous, unfortunately, after about ten minutes of walking the comfort level plummets. Hopefully I can find some gel insoles to help with that. And in parting, a picture of Jager, the ridiculously photogenic dog. All photography in this post was done by Misha Sgro. She's a fabulous photographer and artist, you should all check her out.